Leaving aside the slightly mangled English, that really couldn't be clearer, and is excellent. 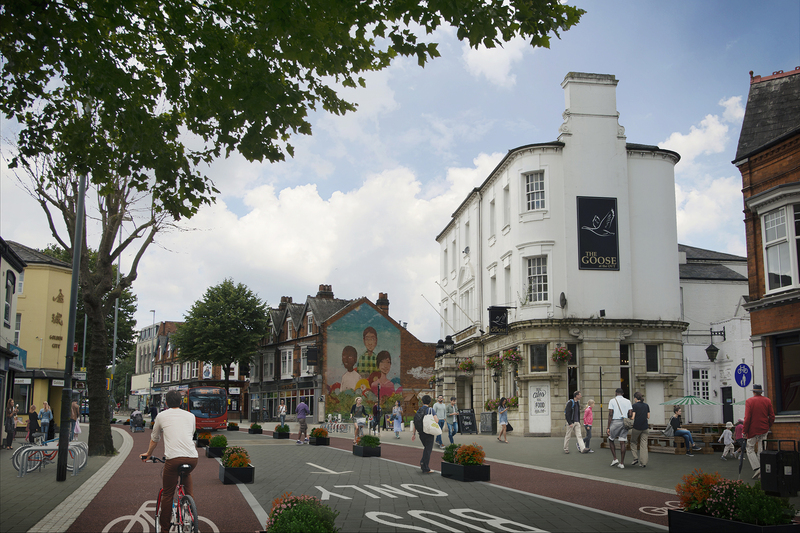 And so for the meeting Cycling UK had put together some visualisations (such as that shown left) of what that might look like on Bournbrook high street. These showed the existing four sub-standard lanes replaced with space for cycling and public transport, ie "an environment where people are put before cars, where residents, workers and visitors can safely walk, cycle or take public transport". Also presented were the revamped plans for Selly Oak Triangle by Birmingham City Council's highways department. Did these show "an environment where people are put before cars, where residents, workers and visitors can safely walk, cycle or take public transport"? 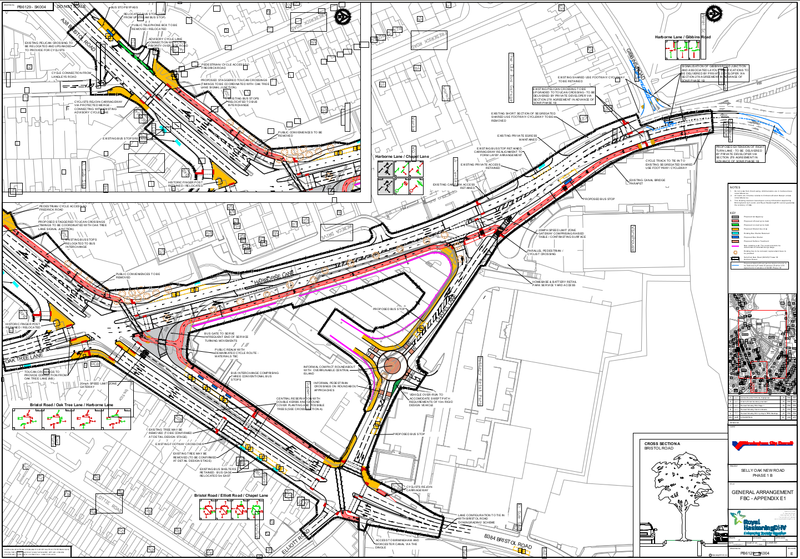 Whilst the revised plans (below) show a significant shift in the right direction, the answer appears to be "no". All is very far from green. Push Bikes and other active travel campaigners raised objections to the original plans, and as a result significant changes have been made, including segregated cycleways. However, the plans still prioritise car travel over cycling and walking. Whilst more crossings have been added, people on foot and on bikes still face having to cross the road in multiple stages, with a long wait at each stage. Some of the cycling facilities are shared paths, which are hated by cyclists and pedestrians alike. One of those shared paths represents the direct route between the canal access point (the tow path having been resurfaced to aid cycling), and Harborne Lane. Even the segregated cycleways give way to motor vehicles (twice at the Harborne Lane / Chapel Lane junction), and they are somewhat narrow. The Dutch standard for new bidirectional cycleways is four metres, to provide adequate capacity. From page 71 of this document, we can examine the detail and see that along Harborne Lane the new Selly Oak bidirectional cycleways will be just 2.5 metres wide. The maximum width is on Selly Oak high street, where they are 3 metres wide. This compares with over three metres for each of several motor traffic lanes. If the aim of the Green Travel District is to put people before cars, why is so much space dedicated to motor traffic, especially on the high street? Why does the high street need to remain a multi-lane dual carriageway, given that it is marked at the Bournbrook end "lane configuration to tie in with Bristol Road 'downgrading' scheme"? I asked the engineer present at the meeting that very question, and he told me this was needed to provide sufficient capacity for motor traffic along the A38 corridor. In other words, on the Green Travel District high streets Birmingham City council is ignoring its own policies and reasoning, and once again putting cars before people. Maintaining the high level of motor traffic will maintain the existing high levels of pollution on Selly Oak and Bournbrook high streets. Below I've used the DEFRA air quality map to map out pollution levels in this area since 2010 (data is not available after 2015). Over this time the annual concentration of nitrogen oxide (NO2) has been 30 to 50 µg/m³. The EU legal limit is 40 µg/m³, mirroring the guidance given by the World Health Organisation. The legal limit isn't the same as what is advisable, which is much lower. By the time the environment is approaching the legal limit, people are suffering. In 2010 the roadside nitrogen dioxide levels around the Selly Oak Triangle exceeded the legal limit as set by the European Union. In 2011 the roadside nitrogen dioxide levels around the Selly Oak Triangle exceeded the legal limit as set by the European Union. In 2012 the roadside nitrogen dioxide levels around the Selly Oak Triangle exceeded the legal limit as set by the European Union. In 2013 the roadside nitrogen dioxide levels around the Selly Oak Triangle exceeded the legal limit as set by the European Union. In 2014 the roadside nitrogen dioxide levels around the Selly Oak Triangle were just below the legal limit as set by the European Union. In 2015 the roadside nitrogen dioxide levels around the Selly Oak Triangle were just below the legal limit as set by the European Union. So whilst things have recently improved slightly, the Selly Oak Triangle and Bournbrook high street have been above the legal limit for many years. Clearly maintaining the current level of motor traffic is not a way to significantly reduce pollution levels and keep the area well clear of the legal limit. Unfortunately the council wants to attract even more motor traffic to the area. Part of the plan for Selly Oak is the continued development of the car-centric retail park, an American style arrangement of "big box" shops with the car park outside the front door, placing the emphasis on arriving by car. When shops front on to areas with restricted or no motor traffic, and car usage is deprioritised, it becomes pleasant to arrive by bike or on foot, and to linger. That results in trade going up, just like it did when New Street was pedestrianised. And active travel means less pollution. New shop units have been built on Selly Oak high street, but they remain unlet. That is hardly surprising, given that the high street is and will remain a polluted, multi-lane dual carriageway. Motor traffic suppresses trade. There is one glimmer of hope, of a kind. A visiting American friend of mine expressed surprise at the retail park development. In America, car-centric retail parks are dying like flies. Given the choice between driving to a sterile retail park, and sitting at home ordering things using the internet, Americans are opting for the latter. The evidence provided by the uncollected, overflowing recycling bins where I live suggests the British are doing the same. I know I am. Whilst that might limit the potential rise in pollution levels, a downturn in trade would not be good news for Selly Oak. Councillor Changese Khan (Selly Oak Ward) Supports the proposals. Councillor Karen McCarthy (Selly Oak Ward) Supports the proposals. Councillor Brigid Jones (Selly Oak Ward) Supports the proposals. Steve McCabe MP (Selly Oak District) Email sent 09/09/16. No comments received. You can see by the responses above that it is necessary to change political minds if we are to get real Green Travel Districts in Birmingham, not just warm words. So it is vital to keep bothering them (I've provided a contact link for each in the table above). This website (and others) provide a library of good practice right at your fingertips that you can quote. Keep in mind that the techniques described on this website (such as closing routes to through motor traffic) have been tried around the world and they work. They are not the wild ideas of dreamers. Secondly, if you are not a member of Push Bikes, please join us. The bigger we are (in terms of members), the more influence we have. And you can see, we are starting to effect change. Imagine how much more we would achieve with the weight of a bigger membership. And if you are a local politician reading this, isn't it time you fought for a Selly Oak "with less congestion, less pollution, [and] fewer accidents", and a "healthier, safer, more productive community"? Isn't it time you demanded a real Green Travel District, like those shown below? This German town has reclaimed its marketplace. In place of a dual-carriageway with centre reservation parking, there is now a traditional town square, where twice a week there is a large and thriving farmers' market. On warm days people sit at tables in what was once the middle of the road, and engage in conversation over coffee and cake. You can still drive here if you have to, but the speed limit is 15km/h, and the only way out is the way you came in, so not many people do. For cyclists and pedestrians it remains a through-route. Motorists making a through journey are sent all round the back of the town; it's quicker to cycle, so that's what many people do. The square is lined with cycle stands, and they are routinely fully utilised. The remodelled street looks so different it is hard to tell it is the same place, but the viewpoint in both pictures is almost the same, the only difference being that in the first photo the camera is turned more towards the right and is higher up. Look for the white building in the distance with a terracotta roof that is marked with a red dot in both photos. The next two buildings on the right (closer to the camera) can also be seen in both photos. Then there is a building that has been replaced by the time of the second photo, and finally there is a white building with square features just below the roofline. That last building is on the far right in the second photo. 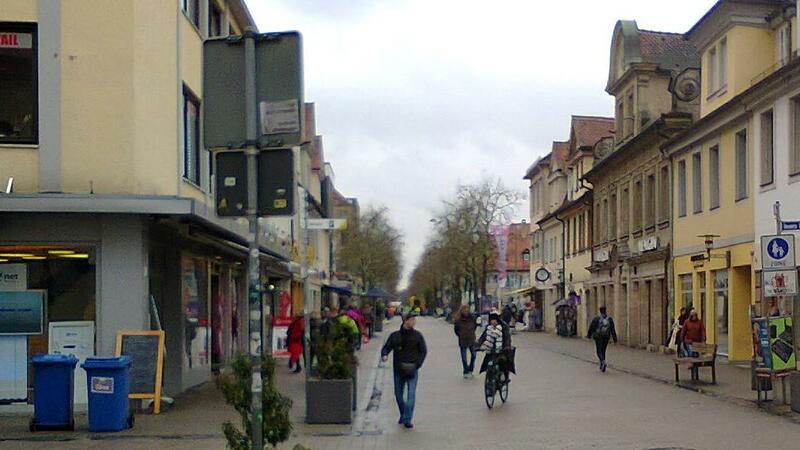 Motor traffic has been restricted on this Bavarian high street, whilst walking and cycling has not. The result is an area with little motor traffic that is pleasant for walking and cycling, and attractive to shoppers. Pedestrians and cyclists bring trade to shops on the high street, not a queue of motor traffic that makes an area look and sound busy. Trade went up 25% when New Street in Birmingham was pedestrianised. This is not a Shared Space, as invented by Hans Monderman, even though it might look like one from the construction. This visualisation created for Cycling UK shows what active travel campaigners have in mind when talking about Birmingham's Green Travel Districts.